Everyone met at Shirley’s in Mancelona to fuel up before taking on the roaring waters of the Jordan. When we arrived at the put-in, we noticed that someone had improved the access. They covered up the cable with gravel, and made a nice sloping surface on the north end of the ramp, which made launching a lot easier. We all marveled at the light weight of Glenn’s new canoe, until he filled it with the usual 50 lbs. of light weight gear. The weather was bright and sunny, but cool enough that some of us chose boots over sandals for wear on the river. The trip down the river was uneventful. We all checked out the new access being built just upstream of the Old State Road bridge. At Webster we stopped to eat our snacks, and use the outhouse. Glenn and John paddled each other’s canoes from there down to Rogers Road. 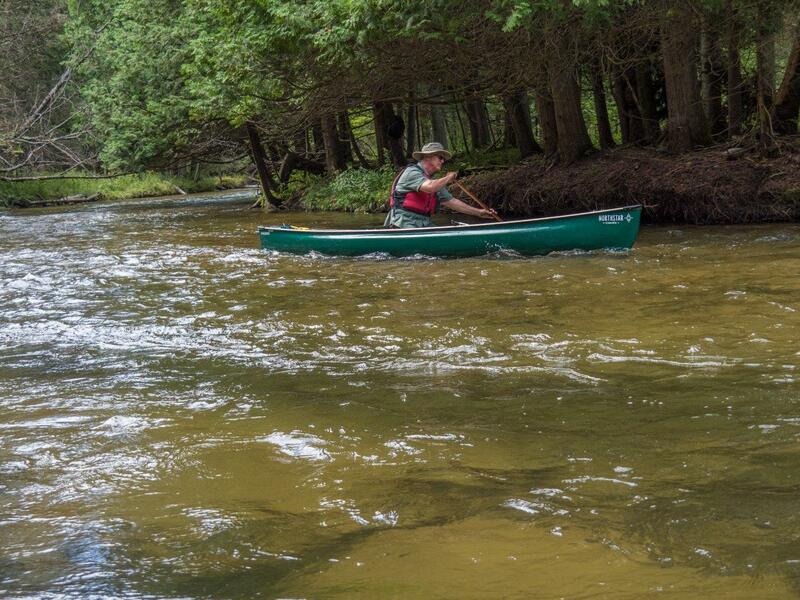 John’s review of Glenn’s new Phoenix canoe was short and sweet. It’s nice!